*Habil is from Humus, in Syria. He is married and has two sons and one daughter. One of his sons is living with him. His son is also married and has five daughters. Habil’s other son has four sons. Habil’s daughter is married, but she has suffered psychological shock because of the Syrian war. Habil’s brother was killed while he was at home visiting, and that violent group also killed his cousin and brother-in-law for no specific reasons. These shootings have also caused suffering for Habil’s daughter. In 2013, the family left Syria and moved towards Jordan. They walked for three days until they arrived at the border, to the Za’atari camp. They lived in a tent for a year and the conditions were bad, so they moved to Um Battma Village. Their situation is so bad. They cannot work and Habil is an old man. His son is not allowed to work. They are hoping to go back to their country Syria one day. The family was so thankful for our visit. They said, “We've been here for five years and this is the first time that we have some people come to visit us and offer help. You made us so happy as we felt that there is someone who cares about us, and that we are not forgotten. Thank you." Our new clinic welcomed 44 Syrian patients. We were able to encourage them as well as offer medical treatments and some physical help. One day a lady was wondering if she was pregnant. She was concerned because their life is difficult here in Jordan and they will not be able to provide for a new-born baby. We encouraged her to have hope and know that a child is a gift. She went to Syria and stayed there until 2007 when she returned to Iraq. Her parents were sick, and they needed someone to take care of them. Her brother also needed help because he has epilepsy. When she returned to Baghdad, she had to go to the Ministry of Immigration and Expatriates to complete some papers. One of her employers refused to give her an approval because he had asked her to marry him temporarily and she didn’t accept his offer. She then received new threats and had to leave Iraq again. Her parents were afraid and very concerned but Elishat decided to leave Iraq and come to Jordan. Since she arrived in Jordan, she has prepared everything for herself. 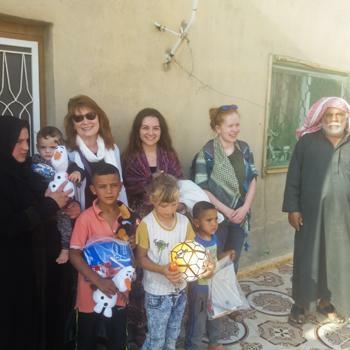 She also provides everything for her family who is now with her in Jordan. They have been in Jordan for 11 years, and Elishat and her family are registered at the United Nations. They want to go to any safe country, but nothing has happened yet. Elishat is a very strong woman and has a big heart. She serves and takes care of her elderly sick parents as well as her brother. GHNI has visited her and enjoyed the time spent with her. She is powerful and full of joy. She shared with the team how she gets her strength from within, and she was so thankful for our visit because she felt that she is not forgotten, and that we care about her and her family. In our new clinic, we are open for two days a week and we welcomed 44 Iraqi patients this month. Our doctor and her assistant provide medical care, physical assistance and encouragement to the patients. *For the purpose of safety and wellbeing, “Habil” and “Elishat” are pseudonyms for individuals being helped by this project.